Orientation refers to locating a geographic site or feature on a map. The orientation process can also involve the mapping of sites and/or features. Through the available online mapping services from SANBI it has become easy to orientate yourself and find a specific site or feature. The BGIS website hosts online interactive maps with a wealth of biodiversity information that is usually only accessible by means of GIS. Locating a site for which you only have coordinates. You will find that you get the most out of the BGIS website and online maps if you use them in conjunction with topo-cadastral sheets. The BGIS online maps complement the topo-cadastral sheets by organising important contextual information about biodiversity and conservation priorities in a spatial format that can be readily related to more conventional maps, giving a very good overview of the biophysical characteristics of the broader region. 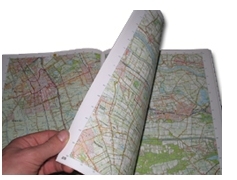 This approach depends on your map reading abilities and the types of maps that you have at your disposal. You will need the National Geo-spatial Information’s provincial series map for your area. An atlas may also be necessary because of the broad scale of the provincial map. The atlas can help you pinpoint the town (or at least its approximate location) on the provincial map. The provincial map, in turn, will give you the boundaries for local municipalities, district municipalities and magisterial districts. Once you have identified the appropriate municipality, go to ‘Municipal Summaries and Datasets which shows you how to access conservation plans and biodiversity statistics via the BGIS website.